Want a chance to win a T-Mobile phone? Of course you do, and our friends over at PhoneDog are doing just that. 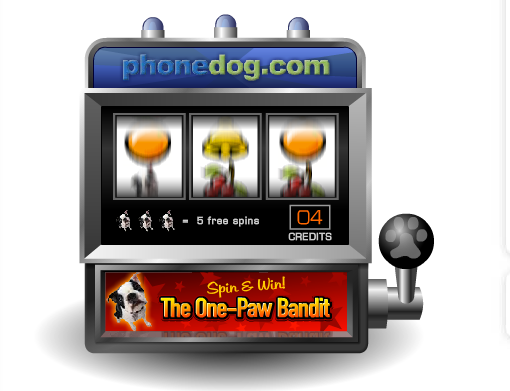 They have this One-Paw Bandit, spin to win game that will give you five spins on the website and another spins over at their Facebook page. You will need to sign up for an account, but it’s a free phone, so it’s worth it. The current prize is a Motorola Cliq XT. They are then giving away 2 white MyTouch 3G‘s, with 3.5 mm headphone jacks, after that (unless they change the order). Then WAY after that they are giving away another Cliq XT and 2 black MyTouch 3G’s with 3.5 mm headphone jacks, so stick around. Good Luck! Same here… I wouldn’t mind winning a Cliq Xt. I actually kinda wanted one… but with all these other devices coming I am not sure. But if I win… that’ll work for me. Then I can save my upgrade until the ultimate Android Device comes along… which hopefully will be soon and sometime this year. You know, I’ve actually stop playing this until it said TMO phone to win. in concordance to the amount of people who play now. Its past assassinating to me now. I’m never spinning the slot machine again. Its sad! You are quite possibly right, that’s why I updated my location and name. But i don’t do pictures. Want a chance to win a T-Mobile phone? Of course you do, and our friends over at PhoneDog are doing just that. They have this One-Paw Bandit, spin to win game that will give you five spins on the website and another spins over at their Facebook page. You will need to sign up for an account, but it’s a free phone, so it’s worth it.